Crowdsourcing is all the rage nowadays, so I thought I’d make, er, empower you all to come up with your own theme this week. Yeah, that’s it. with possibly strained metaphor to publishing technology. Jokey second paragraph with parentheticals (galore). Closing paragraph, ending with a one-word sentence. Really. Adobe is taking this crowdsourcing thing seriously, with a few new initiatives that seek to tap the power of the hivemind. First, Adobe Community Publishing is a rich internet application that allows/requests/begs you to write and upload content related to Adobe applications to their site. Secondly, Acrobat.com is also looking for a few of your good ideas. Got a feature or functionality request? Go over to ideas.acrobat.com and make your voice heard. Also in a nod to crowdpower, Serna has make its Syntext XML editor open source. Back in the day, the only people who could see music were in psychiatric wards and Grateful Dead shows. Now any shmoe with Photoshop can see music, edit it, and save it back as a sound file. Head over to Photosounder for info on editing audio files as images in Photoshop. Design Science, makers of MathType, Math Flow, and Kraft Matharoni and Cheese (jk), has a useful guide to Math in eBooks, in the ePub standard. While we’re on the XML subject, might as well point out the XML in Practice Conference coming up at the end of September in D.C. I learned a ton at the one in Boston a couple years ago. And I got a MarkLogic t-shirt, which catapulted me to a level of geek usually unseen in the Boston area outside the MIT campus. Maybe I can get Johnny Cupcakes to hack the design, and we can sell ’em for $40 a pop. Don’t touch that PDF if you don’t know where it’s been. Especially if it has a trojan virus embedded in a tiny Flash video. Apparently we still have to be suspicious of PDF from unknown sources. Typophile has a neat Flash tutorial on Typography 101. Laughing Lion Design has a tutorial on achieving a letterpress effect in Photoshop. Finally, over at my home away from home, InDesign Secrets, Steve Werner has posted tips and tricks for interactive Buttons in PDF (via InDesign). Till next time, (insert closing). Actually, he’s more focused on Flash, making deals with Netflix, Comcast, and Disney to deliver content in Flash to your TV. The question is, do you want Flash on your TVs? Personally, I don’t. TV’s craptacular enough as it is, without having to install the latest plug-in version and reboot the set before you can watch MythBusters. Or commercial pop-up ads. Or the prospect of having the SuperBowl “Unexpectedly Quit” while a team is driving for a touchdown. When it happens (and you know it will), it’ll be a 21st Century Heidi moment. Want to know who else is reading Publicious? Check out Quantcast.com for a look at yourselves. It’s fun to see where everyone is coming from. I’d like to give a shout out to my 10 unique cookies in Bulgaria. Yo! S’up, Razgrad? Trying to enhance your software developer skillz? By all meanz, check out Refcardz.com for free PDF “cheat sheetz” chock full o’ information and well-dezigned. Also worth checking out are Adobe’s new “marketplaces.” Claiming to be “the ultimate resource” and “the most comprehensive collection products, services, and communities available.” Sounds like Exchange on steroids. So far there are two marketplaces, Photoshop and AIR. If they succeed, there will no doubt be more. I’ll give you three guesses who just bought Stanza, the eBook reader app for the iPhone, and the first two don’t count. If you said Amazon, you win (or do you?) Hmmm. By the way, Amazon just announced a large format Kindle, aimed at the textbook market. My heart’s still with the underdog, PlasticLogic guys. But either way, if my son’s backpack can get under 20 lbs, I’m good. Looking for a perfect Mother’s Day gift? Sure, Facebook was ruined when your mom joined, but at least you have Twitter, right? Well, before mom starts following Ashton Kutcher and tweeting links to your prom photos, you might be proactive and give her the new Twitter book from O’Reilly. Who knows, maybe she’ll become a niche titan and buy you a shiny new MacBook Pro. Finally, I leave you with the disturbing images of the real origin of swine flu: Johnny Cash singing with Miss Piggy. Be good, and remember, cough into your elbow to keep your PDFs virus-free. Now that the corporate malfeasance has been dealt with by a powerful surge of re-branding, AIG can go back to standing for “anchored inline graphic.” Whew! For a minute there I was worried we were all screwed. At least now the printers will be happy with all the millions spent on new business cards, stationery, signs, etc. I just posted a way of using GREP styles with Preview in InDesign to play and learn GREP with fewer tears and gnashing of teeth. JetSet Communications Adventures in GREP. The InDesiger’s Undocumented Bit of GREP Gold. Counting human beans: maybe the AIG bonuses wouldn’t have happened if the execs’ performance had been subjected to this kind of scrutiny. If you like your graphic design preserved with a good dose of sodium benzoate, check out the magnificent decontrstuction of Pepsi’s new look. at Before&After. Lastly: Sherman, set the Wayback Machine for exactly five years ago. 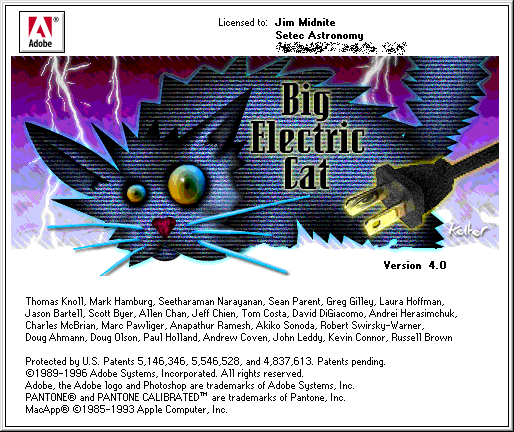 When Adobe was touting the new CS as the most important box of software you’d see for the next five years. Guess they didn’t see the fact that in five years, there wouldn’t BE any software in boxes. They were clearly living in the past. If the cloud people have their way, in five years, there won’t be any software on my computer. See ya, kids. I’m off to collect my bailout bonus: a bowl of Ramen. If the prospect of a Great(er) Depression has got you down too, pull up a bowl of mac and cheese and check out these links. They’ll make you feel better (or at least distract you while the bank changes the locks on your house). First up, Prepress Pilgrim. It is an excellent blog written by DJ Dunkerley, about marketing, business, and technology issues in prepress. There’s also a whole section of career management posts, including stuff like Trying To Find Job Websites That Aren’t Skanky. DJ used to work for Creo back in the day, developing a little PDF workflow thingy you may know better as Prinergy. For my money, Prinergy is coolest thing in prepress since, um, ever. So you say you need a content management system, but the global economic crisis has left you broke? Check out Drupal. It’s a free, open source CMS that’s gaining popularity. And it’s the CMS behind Allyouneedischeese.com. What more do you want? Bulletin Bulletin Bulletin…Adobe makes it safe to swap PDFs with strangers again, by posting a patch to Acrobat 9. Crowdsourcing: necessary evil or evil evil? Personally, I’m thinking evil evil. Pitting designers against one another, and eroding the quality and wages of their profession, just ain’t my idea of a party. What’s next on the road to the bottom? How about we crowdsource medical care? Post your symptoms and anyone who claims to be a “doctor” can diagnose your illness on spec. Then you pick the treatment that fits your budget. Hmm that might work; Obama are you listening? If you are a freelancer, or think you might be one soon, check out Michelle Goodman’s blog, the Anti 9 to 5 Guide. She’s been freelancing for more than 15 years and has written a great book on the do’s and don’t of the freelance world. Yes, it’s aimed at women, but good advice is good advice. This I found interesting bit of Google on Google crime: Hitwise notes that GMail is now more popular than YouTube. It’s well on its way to becoming more popular than food, water, and air. Another fine blog, this time from inside the Adobe Empire. Bob Bringhurst is the man in charge of official InDesign documentation. Can’t get much closer to the source than that. On my bucket list is to solve the frigging Rubik’s Cube once and for all. In case I never get there, I can always fake it with a tutorial to make your own Rubik’s photo cube in Photoshop from any image. It also gave me the idea that you could print out whatever picture you wanted on sticker paper and make your own photo Rubik’s in real life. I might have to try that. Guess I’ll have to put my plans for an origami TV screen on hold. Those super cool OLED flexible screens are also feeling the bite of the lousy economy. Last, if you might find yourself up on stage in front of a crowd anytime soon, I suggest you first check James Duncan Davidson’s 8 Tips For Speakers. His perspective is literally unique, as he is a photographer who’s shot speakers of all kinds in the act of connecting (or not) with their audiences. Till next time, I just have one question. You gonna finish those fries? Ignite is a site sponsored by O’Reilly, and devoted to building the worldwide community of Ignite speakers. Who’s an Ignite speaker? Anyone with something interesting to say on topics “geeks hold dear.” Could be almost anything. Past topics range from hacking chocolate to buying cars to using Twitter to keep tabs on your houseplants. But there’s one catch. You must do a slideshow presentation that is exactly five minutes long, exactly 20 slides long, and each slide automatically rotates after 15 seconds. The tag line is “Enlighten Us, But Make It Quick.” Not only am I a fan of the Ignite speaking rules, I think they should become law for all business presentations. Keynote and Powerpoint should only save in Ignite format. Here’s a pretty lengthy list of Adobe products and people on Twitter. Sadly, no Big Electric Cat. I posted the results of a little bug testing I did with the latest InDesign update (6.0.1). A couple major bugs squashed, a few other critters still scurrying around. The CMYK-RGB t-shirt inspired me to look for more geek merch. CafePress has a well-formed assortment of XML-tagged apparel. My favorite is the baseball cap. If you need to hire an XML developer, wear the hat when you meet them. If they laugh, hire them. Flash on Tap is an upcoming conference here in Boston that will bring together the coolest Flash developers and brewmasters, and mixing code with kegs. Should be a great time. If you have any interest in going, be aware that the early bird pricing ($595) ends April 28th. From the Department of Awe-inspiring Process Diagrams. Behold. And Bewarned, it takes a while to load. This is either showing how to use Wikipedia to do news article clustering, or it’s the process my wife and I follow to get our kids ready for school in the morning. Insanely brilliant or brilliantly insane? The Book Cover Archive is pretty much what it says it is. Just don’t judge the books, by their uh, never mind. In our house, we installed front-facing book shelves in the kids’ rooms, as a stealth literacy-marketing tool. Works like a charm. Showing the covers instead of the spines makes the kids about 1000% more likely to pick up the books and check them out. 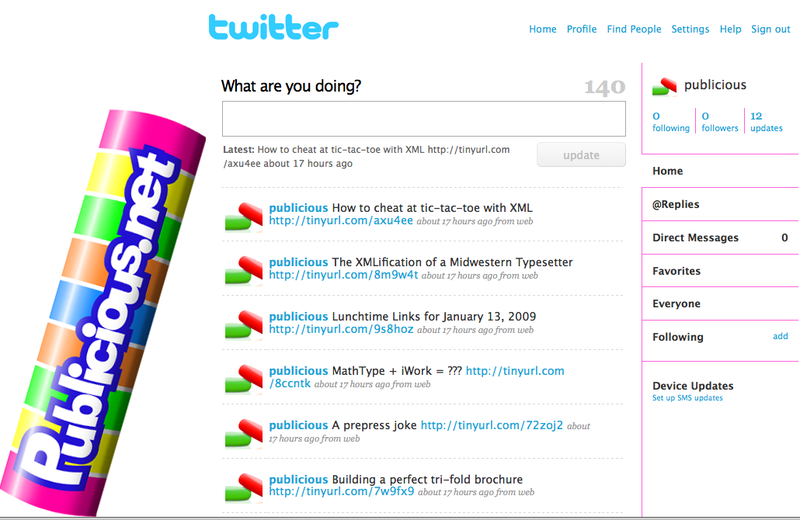 TweetGrid is a browser-based “Twitter search dashboard that allows you to search for up to 9 different topics, events, converstations, hashtags, phrases, people, groups, etc in real-time.” I’m not sure what a “converstation” is, but TweetGrid is pretty neat, with the potential to be completely overwhelming. You can set up search boxes in a grid layout, to have literally hundreds of streaming tweets on your favorite topics pour down your screen. Works great, especially if you have nine brains and eighteen eyeballs. Now that you’ve had your broccoli, I leave you with a sugary dessert. Blambot.com’s article on comic book typography and grammar. Yum (and thanks, Greg). They also have some fun fonts for sale. What Are Your Skills Worth? That is the question, with all apologies to the balding bard from Stratford-on-Avon. And there’s a website from some place near his old ‘hood that can answer the question. ITJobsWatch is a UK site that gathers data on the tech job market and maps it to provide a moving picture of the value of tech skills, or at least the value of those skills in the UK. Man, I wish I could find a site that did the same thing for the U.S. The site provides charts and graphs showing the evolving level of demand for almost 5000 tech skills, tracking average salary and freelancer rates. You can break down the results by region or specific location. Setting aside cosmic questions of free will and the value of art, if you’re a UK parent you might want to start coaching your kid to dream of one day being a Senior SAP Programmer, and downplay notions of becoming a Flash animator. The SAP kid makes seven times what the Flasher does. They barely make more than a telemarketer, who, in turn, makes more than a Helpdesk operator. Ouch. You can compare different skills, so you know if learning Flex might really pay off (it will), or you should throw out that old PageMaker manual (not yet—there’s only about three PM jobs left in the whole UK, but they pay really well). There are tons of interesting data to look at. F’rinstance, the salaries for Quark and InDesign top out at nearly the exact same amount: £30k. But there’s a greater gap between the Quark haves and have nots, and the overall trend for Quark seems to be under the influence of gravity. 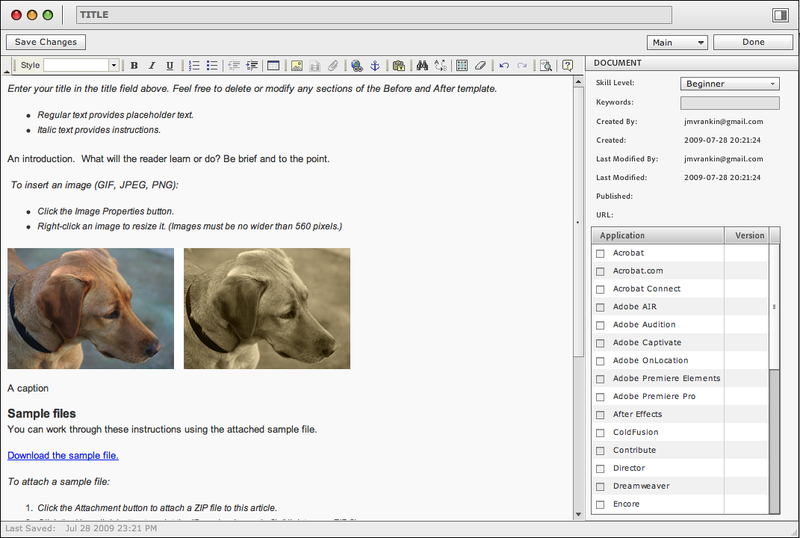 PlanetPDF is a seriously large, all-things PDF website, sponsored by NitroPDF, an alternative to Acrobat. I don’t think a lot of people even realize there is an alternative to Acrobat. I’ve never used Nitro, so I can’t say if it’s the cat’s meow or the litterbox, but it’s been around for more than 10 years, so it must have some satisfied users. The site has plenty of Acrobat-related content: tips, articles, forums, 20 RSS feeds, and a plethora of PDF-related software to buy from all corners of the known Universe. Seriously, I think there are some Wookie developers hawking an “AAAAAAAAAAAARGUUUUUUUMMMMMMFFFFF” plug-in. AcrobatUsers.com is another biggie, with tutorials, videos, forums, news, and stuff to buy. Lastly, in today’s obligatory Twitter bit: for anyone so inclined, you can now follow Publicious on Twitter. Just click the link on the left sidebar of the blog, or here. I’ll tweet all the posts, and related content that doesn’t quite make it into the blog.